Writing a literature review PhD takes weeks and months of careful planning, selection of relevant materials and compartmentalizing them into relevance, as to how to utilize them in the course of the study. Time, money and intellects are some of the rare resources for doing an excellent PhD work hence we always recommend our professional dissertation service help for the best output in writing a literature review for doctoral programs. A literature review in simple term refers to the analysis, evaluation and synthesizing of already existing literature by other scholars on a particular topic, subject matter or research problem under study. The essence of a review of relevant literature is to provide an in-depth look at the research problem to create blocks of opinion supporting and opposing the available paradigms connected to the study. A literature review helps the researcher to give credence to the study providing a basis for the summations he or she intends to reach and thoughts that might align with the researcher’s arguments, findings, and conclusions. Introduction: The introduction helps you set the ball rolling for the discussions on your research problem. It is also helpful to do a quick aligning of the aspects your research covers and areas not to cover. Remember to mention your point of view on the research topic stating why it has become pertinent. Body: Present the main discussion in the body of your literature review by stating the significant blocks or paradigms or schools of thought the study considers. You could adopt the general to specific methods of analysis. Conclusion: Try to address the critical summations of the literature review, gaps the study identified and areas for future collaboration or research. Finally, summarize the literature reviewed. At the point gathering research data, you might need access to PhD interview questions to ask that will help support your summations in your literature review. By now should pick a topic or have one already selected. However, in looking at your research topic, identify the critical components of the research problems to know how to break down your literature review into several themes or concepts. Doing helps you set the stage for more in-depth discussions on the research problems. The outline makes it easier to identify the opposing and supportive arguments the research problem is about. A theory is a postulation that helps create a guideline on the way things work or how specific phenomenon come into existence and sets a basis for identifying and accepting them. A hypothesis can set the boundaries between two variables or views. A theory or hypothesis when discussed extensively in your literature review becomes relevant when it is time to come up with findings and reach a conclusion. By compartmentalizing your research work, it becomes easy to identify the primary schools of thoughts or arguments for or against the research focus. It provides a natural means to evaluate and reach a conclusion by the researcher. It is pertinent to link all discussions or existing finding to discoveries in the course of the research work. It also helps to state areas of contribution to the body of academic knowledge due to the research findings. References and bibliography are two essential aspects of a research work. Every single citation or quotation needs proper referencing. All information sourced from online resources and hard copy journals, books, newspapers. Magazines etc. must be appropriately referenced in the institutions preferred referencing style, APA or MLA. Sift through materials: Not all research works with similar content will be relevant to your study. Learn to read and classify documents for or against the research problem. You can go through our PhD literature review example for a guide on how to access academic papers. Reference all quoted sources: Not alluding or giving credence to an author after citing his or her content makes one guilty of plagiarism. Materials consulted should be referenced in-text, end of a chapter and of the entire research work using the APA or MLA style for referencing. Use up to date materials: In some cases, you can do a comparative analysis where it is necessary to look at old records or books and more recent one. In other cases, you need to work with more recent works by authors in relations to your research topic. More recent works provide you with current research and findings on your research problem. Be authentic as much as possible: Go through several related contents to find authors and research information that are similar to the research problem and use them as a guide to locate those materials. Avoid citing a work you have not read personally to avoid misrepresenting facts or errors made by the source from where you lift the information. Avoid lifting or compilation: Understand that a PhD literature review is not a compilation of other author’s work but discussing the gap you have seen and then using other authors’ works to bolster your arguments for and against. The literature review focuses on the available data collected or relevant theories by well-acclaimed experts. A literature review involves summing up existing facts and figures with relevance to the dissertation. 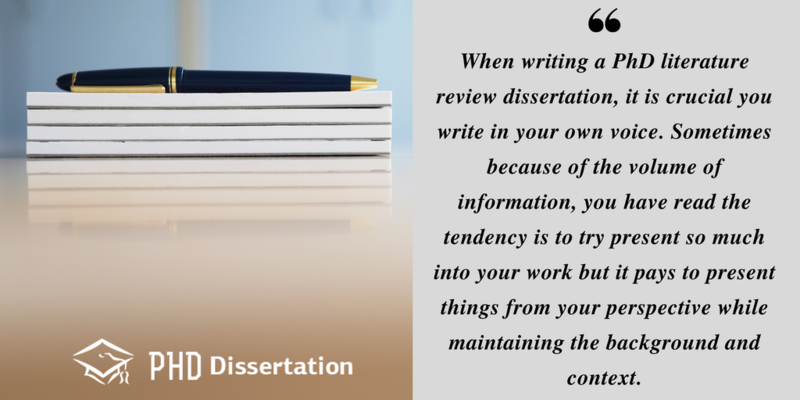 When writing a PhD literature review dissertation, it is crucial you write in your own voice. Sometimes because of the volume of information, you have read the tendency is to try present so much into your work but it pays to present things from your perspective while maintaining the background and context. Learn from the PhD supervisors and graduates. How long should a PhD literature review be? A length of 8,000-10,000 words should be excellent for your literature review. Our professional literature review PhD thesis writing help can set you apart from your colleagues being that we work with PhD holders from different field and disciplines. We understand the importance of doing an accurate work and delivering a well-researched content; therefore, our research writers assigned to write your literature review usually would be an expert in your current field of study, specialization, and majors. At our PhD thesis writing service, we provide top-notch literature review writing through the expertise of native English PhD writers with a 100% satisfaction rate. Such high proficiency and prompt turnaround time are some of the reasons clients come back or recommend their friends and colleagues to us. Become a part of our excellent PhD literature review writing experience. High-level academic standard by writers. Literature review writing for PhD thesis is quite an uphill task requiring time, money and effort to achieve. The technicality and amount of weeks involved in sifting through hundreds of journals and research materials besides the time invested in field analysis and interview sessions, case studies and more can have its toll on anyone. The strain of scaling through the thesis writing one of the primary reasons some PhD students up till date are yet to wrap up their PhD program, but that’s why a reliable PhD thesis writing service like our provides the escape route, helping you achieve your dreams of a PhD in whatever discipline. Get the best professional help with writing a literature review PhD today!